The MBM Destroyit 2503SC strip cut shredder is suitable to use in offices among 1-5 people. It shreds paper, paper clips, staples, credit cards, and optical media. It has a level P-2 security rating which makes it suitable to shred non-confidential documents. The MBM 2503SC can shred 19-21 sheets per pass, creating strip cut particles of 3/16” at 24 ft./min. This paper shredder includes a transparent safety shield in the feed opening as a safety precaution to prevent injuries. 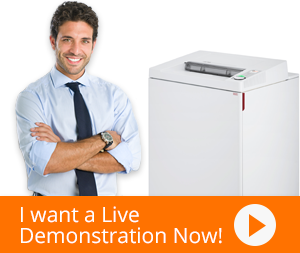 The MBM Destroyit 2503C shredder stops shredding and automatically reverses when too many papers have been fed. Its photo cell sensors help in starting and stopping shredding as the sensors detect paper near the feed opening. The shredder saves operational costs by going into sleep mode after an hour of inactivity. Destroyit 2503SC strip cut shredder prevents motor overheating by having double motor protection. Its steel cutting blades come with a lifetime warranty. Whenever the waste bin is full, it stops shredding. It comes with caster wheels. A unique blend of innovation and convenience, MBM Destroyit 2503SC strip cut shredder is sure to deliver outstanding results.